Doug Smith is so passionate about cheese that he doesn’t even care if you buy his, just as long as you’re enjoying cheese. “I prefer people to buy the cheese they like,” says Doug, co-owner and operator of Natural Pastures Cheese Company in Courtenay, B.C. And that starts with learning about the flavour profiles of different ages of cheese, as well as the varieties. People are keen to learn about cheese, says Doug, but they need to know the quirks of each cheese and figure out their preferences. Take the company’s signature Comox Brie, for example. It’s a traditional bloomy rind soft cheese that starts off very mild but ages rapidly. It arrives in our markets at about 15 days old, but is not fully ripe until it’s 50 to 60 days old. As the brie ages, it gets softer and creamier, and the earthy mushroom-y flavour gets stronger. Doug recommends eating it soon after purchase if you like a firm, fresh milky cheese, or waiting until closer to the best before date if you prefer a full-bodied brie. 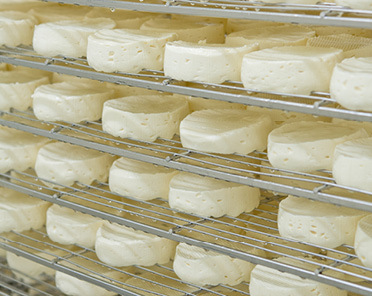 At any age, this cheese has the unique flavour of the West Coast. Natural Pastures uses milk from farms in the Comox Valley within five kilometres of the production site. No wonder it’s a Canadian Cheese Grand Prix and World Cheese Championship winner! Doug’s affinity for good cheese probably stems from his previous life as a dairy farmer. His grandfather set up the family farm in the Comox Valley in the 1920s after moving from North Battleford, S.K. Doug and his brothers Edgar and Philip took over operations in the 1980s and didn’t start making cheese until 2001. 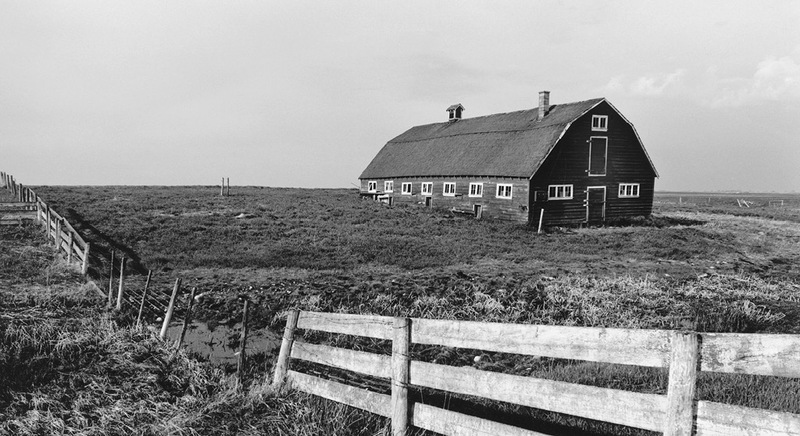 Back then, there were not many artisan cheesemakers on Vancouver Island, says Doug. “It was so far off people’s radar they didn’t know what to think of it,” he says. In order to give his full attention to the fledgling cheese company, Doug left the farm and got down to business. He brought in Swiss cheesemaker Paul Sutter in 2003, and they have grown from making seven kinds of cheese to nearly 20. That’s not to say that Natural Pastures has grown out of their artisan roots. Their cheeses are still made hands-on in an “old school” way, says Doug. 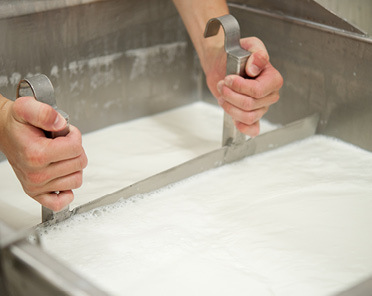 Instead of computers controlling the recipes and machinery, Paul stirs the bacterial cultures into the pasteurized milk by hand for about an hour. 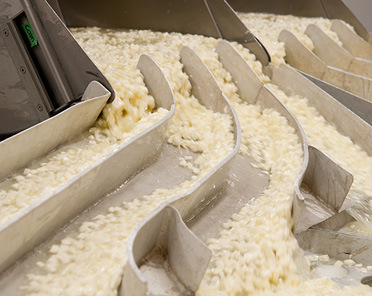 Then he and his team cut the curds with wide wire knives, stir the curds so they separate from the whey, pour the cheese into moulds and then stack them to rest. 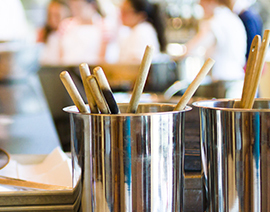 Once brined and matured, they check and hand wrap every piece of cheese. It’s a physically demanding job, says Doug, but a unique one. “You get hands in the curds,” Doug says, “and we’re always experimenting.” The company started making buffalo milk cheeses in 2007 and has even developed verdelait, a blend of cheddar, Gouda and raclette. No matter your palate, there’s a cheese in the lineup that’s perfect for you, says Doug. Stop by and see them at the Saturday morning farmers’ market if you find yourself in the Comox Valley, or pick up Comox Brie or Courtenay Cheddar on Stockboy Special this month in our markets.